Inspired by our place in the cosmos and the "local color" of our galactic neighborhood, fine art photographer turned jewelry designer Lauren Beacham created this wearable tribute to the Sun and its nine planets. That's right—Pluto's still in the line-up, along with the other eight planets of our solar system, each represented by a digital image of the real thing set in a bib-style array of bezels. 18" chain. Handmade in Maryland. Make it a set! Click here to see the matching Solar System Mismatched Earrings and Solar System Bubble Cuff Bracelet. Lauren Beacham designs and makes jewelry with her husband, Tyler, in their little mountain studio in Maryland. The couple’s mutual love of science and space inspired her galaxy collection. Lauren's background in fine art photography and computer imaging, as well as her personal style, are reflected in each piece—a combination of stylish simplicity and unique, beautiful photographed images. To clean, use a soft dry cloth. To prevent tarnishing, store in an airtight plastic bag when not being worn. Item is not waterproof - please avoid getting wet. Our daughter was thrilled and hasn't taken it off since! My wife loves this necklace! My wife wears ''tis to work and casually. I love the colors and the layout of the "planets" on this necklace, and I got several compliments on it. Unfortunately, the chain came apart after one use, and I had to put it back together. Am hoping that my fix will hold because I really do like the necklace. This is a really neat piece of jewelry. I love it! The maker was very creative with this piece. I like it, but wanted to love it. 3.5 stars. 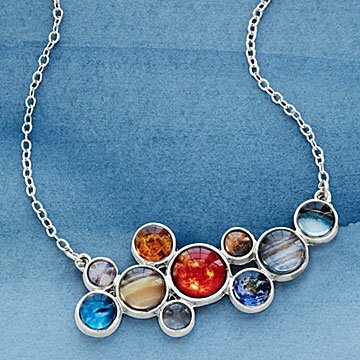 Beautiful necklace and idea - yay for Pluto inclusion! However, you cannot change the length of the chain and the chain is of poor quality for this price point. Design does not allow for replacement of chain. Beautiful piece. Lots of colors to compliment any outfit for any occasion. This necklace genuinely exceeds my expectations. It's much smaller than I expected, which makes it so much more versatile and wearable for work. It's truly lovely, and will really sparkle up a solid crew neck sweater with a blast of cosmic beauty. Beautiful necklace, accurate planet depictions and colors, well made. This necklace goes with everything! My daughter has received many compliments on it. She also appreciates that it represents the planet's in the solar system.